The Kessing is a traditional djembe accessory that provides a dry rattling accompaniment to the drum.. 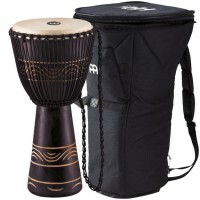 This Meinl Original African Style Rope Tuned Wood Djembes is carved from plantation-grown Mahogany W.. The MEINL Floatune Djembes are modeled after the West African originals. Deep, round-sounding bass n..